Works very well and,easy to install. Completely seals off drafts coming through the AC unit. Enough extra tape to close off gaps around the unit, too. You get good bang for your bucks! It is about 3-4" deep once you can get it on it really does the job! It keeps out draft and cold. This is my 3rd or 4th I have bought some for others they liked mine! Taping a bit tricky if air conditioner high in winfow/on Wall. Nothing to do with spirals, though...? Cover lets me keeps my window ac unit year in the window year round. Keeps cold air out in the winter. Just what I wanted and needed !! Fit my air conditioners just fine. 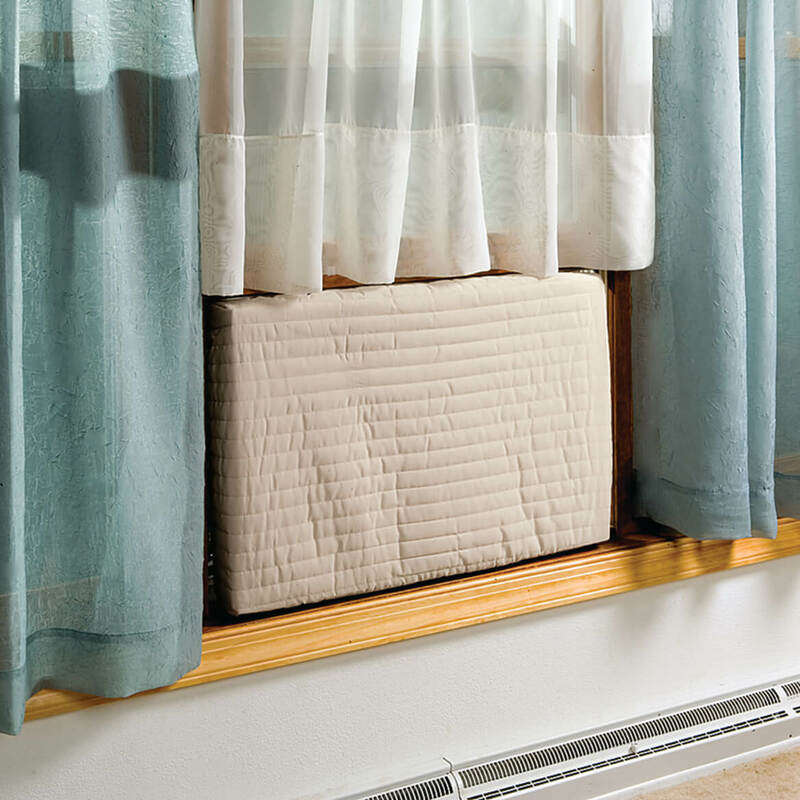 I use this product to cover my window a/c and it fits perfectly and prevents any drafts from getting in the house. The only tricky part I the cord coming out of the A/C cabinet tends to pop the elastic cover off the A/C at that corner. I've been looking for something to cover my air conditioner to stop the cold draft coming into the house, and this cover fit perfectly. I am really pleased with it. Love the indoor air conditioner cover. It really keeps out the drafts. Looks great considering my conditioner is high on the wall. This new AC of mine is new as of 2010. My last AC was smaller and I failed to measure to ensure cover would fit before ordering. I did measure carefully to ensure what I ordered would fit my specific AC. The installation was easy, quick, and allows me to prevent air from the AC itself. The color being beige helps to fit in with any color decor. No drafts and looks pretty good.. If I need anymore , I will buy these . They fit fine on my air conditioners .I bought 4 . Great product. Really helps block some of the air that comes in through the AC in the winter. It's an indoor air conditioner cover. It keeps the air from coming in from the outside as I hoped it would. Easy to use and insulates well. I have used this product in my home for several years on a unit that is installed in the wall. It has held up well and insulates even in the coldest of our NY winters. I just bought another for a window unit that I have decided to stop moving in and out of the window every year. I ordered the insulating side panels too. Kept breezes out all winter. Room stayed warm without any cold breezes. good fit for my window air conditioner. could not find a decent one in the stores. This is quilted with a foam liner. I have a wall unit air conditioner that can't be removed in the winter, the cover fits nice and it really helps a lot, keeps the cold air out. This inside cover is better than the outside covers it keeps the cold air from coming in the vent of course - but they also don't get shredded from the cold & wind exposure. I have a built-in air conditioner in my kitchen, which when the cold weather comes you can feel the air coming into the house...I tried the big box stores for a cover-either they were too expensive of not the right size. Ordering from your catalog was very easy, the cover fits perfect and also comes with insulation to go under the cover. Does what product says it does. Have bought two because look nice covering the air conditing unit and keeps cold air out. There is enough of the foam layer to serve for 2 winters. Putting the fabric cover over the unit is similar to the challenge of putting a new fitted sheet onto your bed - except here the bed has no give to it. The only real flaw is the tape included to seal the foam onto the AC unit. It splits and tears as you try to use it. Your best option is to toss it & pick up some packing tape from the big box store - if you don't have some laying around the house already. You will need less than 7 feet if you are careful. I don't know that I would rely on this as the only cover for winter, but it will block the wind from coming in to your home. I use it under an insulated box type cover my landlord wants used to cut cold seepage. With the two combined, the hole in the wall should be pretty much blocked for the coming years. Hooray! I purchased two AC covers but had to return the large because it was much too large and reordered a small one. The medium was perfect for my large AC. But it is a very good cover and does the job needed. This product works very well at keeping cool air outside and is aesthetically pleasing! :) It also had very easy assembly instructions. VERY glad we went with this product!!! The cover is just wonderful but unfortunately to big! I love your products and especially the delivery time, everything is always on time. Further your customer service is the best ever!!! Cover helps keep the dust and cold out. I like that the quilting over, looks nice on the air-conditioner. I haven't used it yet, but when winter hits, I think it will keep the wind out. I hope I'm right on the money with this one. I used it on my living room A/C during the winter. The A/C is too big to remove so I sealed it and put the cover on it. That side of my house is very windy but it kept the drafts out!!! I'm going to reorder in the smaller size. We are happy with the large size and the results. This cover served my needs. I was using a large trash bag taped over the air conditioner, but the tape kept coming loose. Also there was no padding underneath to block the cold air coming in. This cover, besides looking much more professional, has a pad to tape underneath to block much of the cold air. The only down side is that the tape included was of inferior quality. Bought one a few years ago and it was thicker and made better. I was easy to put on and works fine. I used cloth cover (part you see in the photos) and sewed in a piece of old quilt which works better and is much easier to remove and reuse; plus it is all "Machine washable.". The Polyethylene foam liner (same material as you fin shipments wrapped in) attached with removable vinyl tape (included with item) tends to tear when you remove to use the AC unit; and that liner is NOT "Machine washable.". I could have made this myself for less than half what is being charged. I installed this on my air conditioner. The first time I tried to put it on the elastic broke!. It is now on my A/C with a giant elastic. hole or something for the plug to go through, so the air cannot come out the bottom. It is very windy in the winter where I am, and I need a cover for the window air conditioner so it is not so cold in the house. This is the right size for what I need. I would like to protect my air condition during the winter. To help block the cold. I picked this item because it looks well made, was what I was looking for and had good reviews. It looks like a nice thick A/C cover to keep the cold out. In the past winters, I've been using cut plastic material to cover my AC's but when I saw these I thought I would give them a try. They look so easy and neat and I don't have to fight taping the plastic up every year. This product really blocks the air. This is a very good air conditioner cover. Highly recommend. I need to block drafts. I needed one for my home. Also for the unsightliness of seeing the AC unit exposed, as well as for insulation in winter. Could not find indoor cover in local home improvement stores. I wanted to try to keep our room warmer, since we decided to leave the A/C in the window. To help keep out the cold. Easy to find proper sizing for my LG units and price seems fair and user friendly website. I chose this cover because I like the way it looks and it works very well with the type of air conditioner I have. Chosen becuase I needed one and Walter Drake is reliable in quality and service. I needed covers to help block cold air from coming into my bedroom. I have a window A/C unit in a room in our lower level. Wanted to cover my window air conditioner during the winter months. It works. It will save me money in the long run. It will help with the protection of air condition given the fact that I cannot remove it from its location. I have a window unit and need insulation from the outside elements. Keep apartment warm this winter. This cover will keep cold air out of my bedroom. How does it attach to air conditioner? bungee, tape, elastic ? BEST ANSWER: Thank you for your question. The cover attaches with removable vinyl tape that is included in the packaging. We hope this information is helpful for you. does cover fit on the outside of air conditioner? BEST ANSWER: Thank you for your question. This is made of material for inside use only. It go over the front if the air conditioner in side. And I like it it does keep the cold out. The cover goes over the part thats inside the house. It's an indoor cover, not an outdoor cover. I use it on the inside. are the covers available in the store in Niles? BEST ANSWER: Thank you for your question. No, we do not sell in stores, website, telephone or mail orders only. We hope this information will be of help to you. my ac is 17w 11 tall 6d what should i order? BEST ANSWER: Thank you for your question. The small is 15" high, 18" - 21" wide and would fit, but the depth is only 4 inches on all sizes. We apologize for any inconvenience. How do I figure out what size I need? Do I need to wrap my tape measure around the sides and tops, or is the product sizing based on straight width and height? Thank you! BEST ANSWER: Thank you for your question. To determine the correct size for your unit, you will need to measure its length and width and then consult the below sizing chart. We hope this information will be of help to you. Small (15" high, 18" - 21" wide); Medium (15" - 17" high, 22" - 25" wide); Large (18" - 20" high, 26" - 28" wide). what color are covers ? BEST ANSWER: Mine is a creamy white. It looks good with my décor. It is a very light beige or cream. BEST ANSWER: Yes, it is a little frustrating and this is my second cover that I bought for a friend. Because it is sooo tight it keeps popping when you put one side on and the other snaps off. Take a deep breathe and then take the short side where the chord is and fit tightly back as far as you can and then stretch the length of the A/C and fit around the other short side. Even though it feels like it won't fit it will and once it catches adjust it more around the A/C,pushing it back towards the window. I JUST put mines on yesterday! Good Luck! In addition to the AC cover, I also ordered the insulating side panels which hold the cover in place. Also, there's a possibility that your AC is a different size than mine. So did mine. Very frustrating. I finally taped one side to the AC then put the rest on. It's not pretty but it works. Once you get it on, you will be happy with it. HI Ivan P, I finally got my A/C cover on with one person holding onto the top while somebody else stretches the cover down to the bottom. It does not fit real snug but it works enough for me. Thank you for the info. how deep is the cover? BEST ANSWER: Thank you for your question. The approximate depth of 4”, give or take depending on whether the unit is actually as wide and as the cover or not. We hope this information will be of help to you. My air conditioner comes out into the room 4inches and it covers it well. What is the depth in inches on this product? BEST ANSWER: Thank you for your question. The depth of this item will be determined by how much of the material is used to wrap around the unit its self. We hope this information will be of help to you. Can this be used outside ? BEST ANSWER: Well, I guess you could, but it wouldn't cover much. And would get pretty nasty since it's an indoor cover. It's a quilted fabric cover that is only deep enough to cover the part of the A/C that is inside. Thank you for your question. 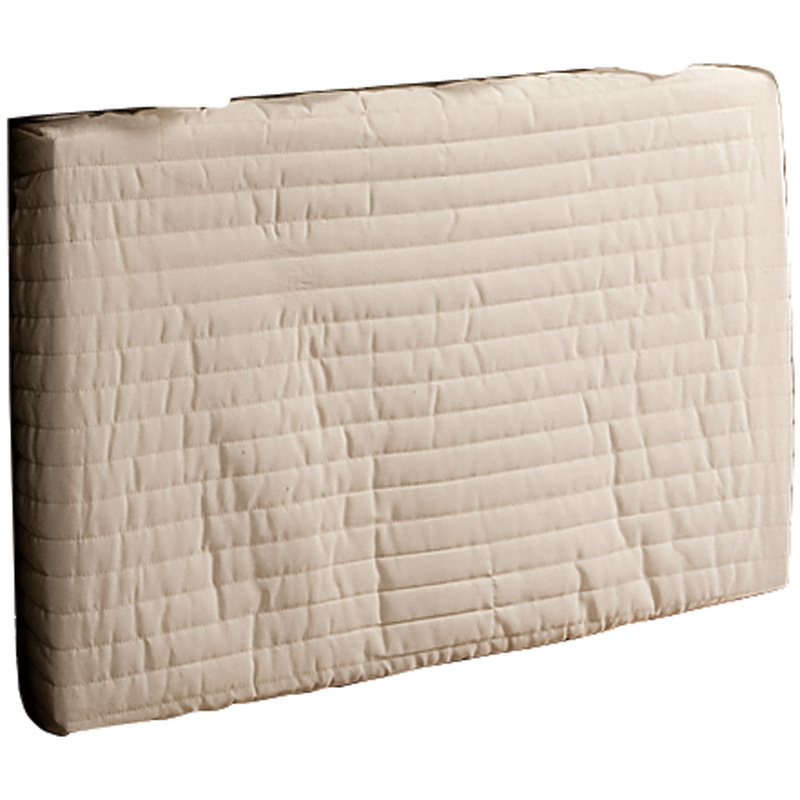 This is a quilted fabric cover and is best used inside the home. We hope this information will be of help to you. does this item come in white or grey? BEST ANSWER: Thank you for your question. no, it does not come in white. We hope this information will be of help to you. My order came in white. I have a Friedrich 24K thru the wall 28W X 20H and its 6 inches deep at its widest point. Cannot find an inside cover. Any suggestions? BEST ANSWER: Thank you for your question. Our cover in 4" deep. We suggest you look at Amazon.com or check with an air conditioner professional. We hope this information will be of help to you. which one will i need to get? Thank you. BEST ANSWER: Thank you for your question. The small would best fit yours. We hope this information will be of help to you. will this fit a sleeve in the wall a/c? BEST ANSWER: Thank you for your question. Yes, this item will fit that kind of a/c. We hope this information will be of help to you.